Dover news and photos from the high banked, one mile racetrack in Dover, Delaware. This weekend the Monster Energy NASCAR Cup Series unloads at Dover International Speedway. View the full 2017 Dover starting lineup below. Dale Earnhardt Jr was on the cutoff bubble in round 1. This weekend, the Monster Energy NASCAR Cup Series as well as the NASCAR Xfinity Series invade Dover International Speedway. The NASCAR Truck Series is on track at Las Vegas Motor Speedway. View the full 2017 Dover International Speedway TV Schedule below. The NASCAR flange-fit body will debut in a few weeks at Richmond Raceway. Additionally it will be in use at Dover International Speedway and Phoenix Raceway. CONCORD, N.C. — NASCAR XFINITY Series teams will have the option of using a flange-fit composite body at three races later this season as the series moves toward incorporating the body into competition full-time by 2019. View the NASCAR composite body photo album and video below. Cody Ware back injury announced, driver pulls himself from competion. Ware drives for a small Monster Energy NASCAR Cup Series team, Rick Ware Racing. The driver pulled off-track at Dover International Raceway, two weeks ago. He pulled off on lap 283 of 406. Below is the list of penalties announced by NACSAR following the race weekend at Dover International Speedway. A man climbed the fence during the NASCAR race at Dover International Speedway. 43-year-old, John Infanti, from Greenwood, Delaware was detained shortly after. Watch the NASCAR fence climbing video below. Today, the Monster Energy NASCAR Cup Series heads to Dover, Delaware. The 1-mile concrete racetrack has a lot of fans surrounding the speedway today, the grandstands are busy. View more photos of the Hulu NASCAR Racecar below. Today, the NASCAR Xfinity Series hits the highbanks of Dover International Speedway for the OneMain Financial 200. An added element, the Dash for Cash will be in play. Offering the opportunity for a big $100,000 bonus for these smaller Xfinity teams. 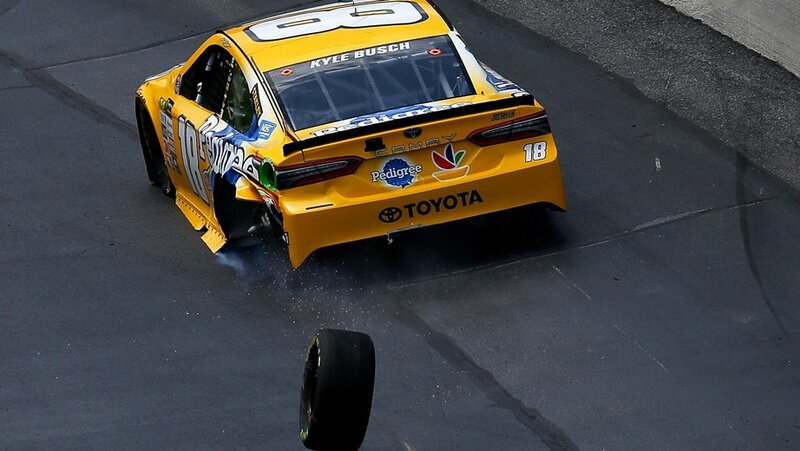 Kyle Busch is still hot after last week at Charlotte. He returns this week at Dover International Speedway, setting pole speed. Kyle Busch and Martin Truex Jr will lead the field to green this Sunday. I was always told that if you didn’t spin in practice, you weren’t trying hard enough. What happened today was nothing like that. Watch the video below. Two drivers, raced hard in practice. The end result: two backup cars. This weekend, NASCAR heads to Dover, Delaware. Tonight, the NASCAR Truck Series kicks off the weekend at Dover International Speedway. Kyle Busch is absent from the field, it’s anyone’s race to win. 200 laps of NASCAR Truck Series racing around the high-banked 1-mile race track. VHT is becoming the new norm in NASCAR. The chemical was in use this past weekend at Charlotte Motor Speedway. It was the first time we saw it used on an asphalt surface in the NASCAR ranks. So what was the verdict? CONCORD, N.C. (May 11, 2017) – Just days after a dramatic win at Talladega Superspeedway, Ricky Stenhouse Jr. and Roush Fenway Racing have announced a multi-race partnership with Little HUG Fruit Barrels. The iconic barrel-shaped fruit drink will serve as a primary partner for two races with Stenhouse and the No. Dover International Speedway will extend SAFER barriers across the frontstretch and backstretch of the facility in preparation for the 2017 NASCAR season.